Fred was born on 10th July 1898 in Chidswell the son of George and Mary Ellen Labourn nee Bollon. He was baptised at St. Paul’s Hanging Heaton on the 28th August 1898.His parents had married at Hanging Heaton on the 29th November 1890 when both made their mark. In 1901 he was living in Soothill Lane, near Gregory Street with his parents and siblings George c. 1884, and Albert 1895. In 1911 the family was living at 81, Co-op Buildings, Soothill Lane, Batley. His father was a coal miner hewer. His service records only give Albert as his sibling. Fred enlisted at Mirfield on the 21st January 1915 into the 2/5th West Riding Regiment. His height was given as being 5ft. 4½ inches, with good vision and good physical development. It was reported that he was a well made lad. His occupation was given as a cloth finisher. His records look as if he gave his age as 19 years. He was transferred to the 1/5th West Riding Regiment and the regiment landed in Boulogne, France on the 14th April 1915. 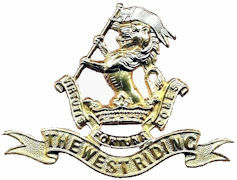 They were part of 2nd West Riding Brigade in West Riding Division. On the 15th May 1915 the formation became 147th Brigade in 49th (West Riding) Division. On 31 March the Division was warned that it would go on overseas service and entrainment began on 12 April. Divisional infantry went via Folkestone-Boulogne while all other units went from Southampton to Le Havre. By the 19th April the Division had concentrated in the area of Estaires – Merville – Neuf Berquin. The Division took part in the Battle of Aubers Ridge (9th May). Fred wrote his last letter home on the 15th June 1915. His effects, which consisted of letters, photo, knife, wallet and numerals were returned to his parents in November 1915. Fred was awarded the 1915 Star, British War Medal and the Victory Medal. He is remembered with Honour at Soothill Congregational Church, Batley War Memorial and Hanging Heaton Memorial ( St.Paul’s).